After comprehensive research on this topic including visiting the Hammer Museum in Alaska, we present you with these 15 tips. We systematically analyzed the processes and the components involved. For the first few tips we have invented, I guarantee you have never seen anything like these before. Because there are many different sizes of nails, people with different hand-eye coordination capabilities, different hardness of surfaces, different construction environments, some of these tips may be more useful than others. You don’t need to master all of the tricks, you just need to identify your own problems and choose the best one or the cheapest one to suit your own situation. Of course, if you never use a hammer, and always hire someone else to do your repairs and remodeling, you will never smash your fingers. Short of that (or having someone else hold the nail while you wield the hammer:) ) , the more hammers you use, the greater the likelihood of injury, especially when you are tired. Thus a good practice is to always be alert, have consistent execution, and constantly remind yourself about sound posture and correct process. Good luck to your fingers. Share this video and help cure your fellow DIYer’s pain. 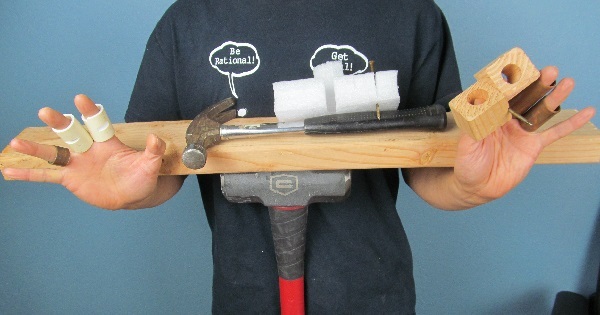 This entry was posted in life hack, tools and tagged 15 Ways To Not Smash Your Fingers, cheapest, construction environment, controlbility, haines alaska, Hammer, hammer museum, hand-eye coordination, magnetic hammers, nail gun, nails, Not Smash Fingers, tips, tricks on December 2, 2018 by David Zhang. In a very short time, student Phil Sun has significantly improved his Taichi push hands skill. Due to job change, he is leaving the class. This video is a farewell demo, a demo of what he has learned. Master Byron teaches his student holding nothing back, this is also a reflection of Master Byron’s teaching accomplishment. This is a very useful video for your push hands practice from Master Byron. Please like it and share it with others. Note that other Tai Chi styles or other levels may have different interpretations of this same topic, we hope people can appreciate this version. You may upload your own practice video to youtube and post on https://basks.com/forum for others to view and comment. It is important we share our experience and discuss the best ways to learn Tai Chi. We don’t want to lose the traditional martial arts treasures, we want to improve them by developing better skills and enabling better learning. This entry was posted in pushing hands, tai chi, tuishou and tagged byron zhang, practice, push hands, pushing hands', T'ai Chi Ch'uan (Martial Art), tai chi, tai ji, tips, training, tui shou, tuishou on November 14, 2015 by David Zhang. In his book, “Outliers”, Malcolm Gladwell proposed the “10,000-Hour Rule”, claiming that the key to achieving world-class expertise in any skill, is, to a large extent, a matter of practicing the correct way for a total of around 10,000 hours. In this video Master Byron, who is very busy in his construction business, shares with us how to find the ten thousand hours in one’s busy daily life. Hope you enjoy and find your own way of Taiji (tai chi) practice. This entry was posted in Push Hand, pushing hands, tai chi, tuishou and tagged byron zhang, Malcolm Gladwell, Outliers, practice, push hands, pushing hands', T'ai Chi Ch'uan (Martial Art), tai chi, tai ji, ten thousand hours, tips, training, tui shou, tuishou on September 24, 2015 by David Zhang. Many people can not rotate their hips and keep their axis straight while under force. It is difficult to practice no matter how many times you are told to relax and are reminded not to use force. This video may just perform that miracle. You will even be motivated because it becomes a fun game (instead of the boring traditional exercise). In addition, we find that if you are practicing some moves for a long period of time without improvement, so changing your routine may speed up your progress. In many of Byron’s videos, he will present various options for you to use in training. Some of them may suit your current state while others may be too simple or you may not be ready to comprehend at your current level. Master Wang Zhuang Hong in his book says: when you crossed the river, you no longer need the boat anymore. Also after you reached a new level, you may have to unlearn or discard some of the practices you used in the previous level. This is a very useful video for your push hands practice by Master Byron. Please like it and share it with others. This entry was posted in pushing hands, tai chi, tuishou and tagged byron zhang, practice, push hands, pushing hands', T'ai Chi Ch'uan (Martial Art), tai chi, tai ji, tai ji ball, tips, training, tui shou, tuishou on August 25, 2015 by David Zhang. How to practice the classical Taichi move “Playing Guitar”? In this video, Master Byron Zhang shared his interpretation of the postures Playing Guitar in Tai Chi. He will share with you the application in push hands and show you the common mistakes. We truly believe there are numerous different ways one can learn Taiji, and hope this is one of many ways that will help you. If you like this kind of videos, we plan to produce a video series of more detailed explanations and push hand applications for each Taichi form. This entry was posted in beginners, pushing hands, tai chi and tagged byron zhang, practice, push hands, pushing hands', T'ai Chi Ch'uan (Martial Art), tai chi, tai ji, tips, training, tui shou, tuishou on June 19, 2015 by David Zhang.